Santa does not stop at hotels. No really, he simply does not. Hotels do not have fireplaces…just sayin’. You might get a discount depending where you go especially if you go to a destination that is popular in the summer. In the winter, during what these areas call “off season,” there are steep discounts that make it more affordable especially with larger parties. There is plenty of room for a Christmas tree and presents. Larger vacation rental homes have tons of space in the main living areas so decorating a tree is no problem. Just remember to pack your decorations! A full kitchen in which to prepare Christmas dinner is at your fingertips. There is an even bigger possibility that you may get to spend a week in your “dream kitchen.” It is common for vacation rental kitchens to come equipped with lots of gadgets and such so that cooking Christmas dinner is actually enjoyable. Big family Christmases are much more fun under one roof. Think about it – in a vacation rental, everyone can stay together as opposed to spreading out at Aunt Betty and Cousin Bob’s homes. And, in larger vacation rentals, there may even be two large living areas with two kitchens. Oh, did we mention that there are enough beds so that no one gets stuck on the foldaway? ‘Nough said, huh. Vacation rentals are much more cost effective. Whether you pick a destination in its off season or go to a very popular area during the winter, your accommodations typically cost less with vacation rentals as opposed to trying to gather everyone at a hotel. Being cost effective also means that it can be “even Steven” so that everyone travels. If you meet at a fun destination, there is always stuff for everyone to do – kids and adults! It is always a great idea to start a new tradition. Create one where you go somewhere new each year – a different family picks a the destination each year. That makes it fun for the group who gets to pick as well as everyone else trying to figure out where they are going. 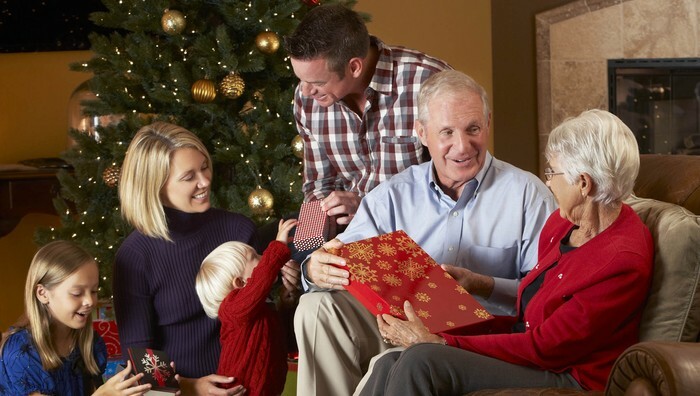 There is so much less stress – especially for the family who usually hosts Christmas. With everyone meeting at a destination, no one has to stress over entertainment, food, a clean house and more. Everyone is neutral territory. You know what we mean by that! A destination holiday creates an environment where everyone is more apt to get along. Even though it is almost Christmas, there is still time to find a place to go – take a few minutes to talk everyone into it then decide where to go and find a vacation rental. We promise it will be a great holiday.